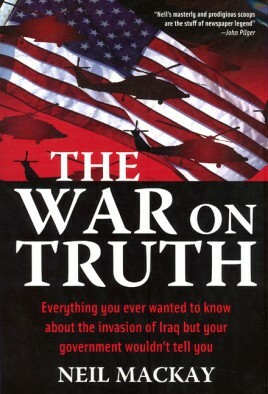 The War on Truth investigates all aspects of the lead up to the war in Iraq, its execution, and its aftermath. Neil MacKay contends that the public was systematically fed untruths in a manner that questions what kind of democracy we really have. MacKay, award winning investigative journalist for Scotland’s Sunday Herald newspaper has covered the West’s intelligence agencies for many years. In this book he questions why ‘intelligence’ missed 9/11 and why the best funded intelligence networks in history got things so badly wrong. The WMD debate is also covered. MacKay’s extensive contacts in the intelligence community make a telling contribution to this investigation and we see an intimate picture of how intelligence is gathered, how it is interpreted and why things go wrong. We also gain an insight to Neo–Cons, the radical think tank that surround George W. Bush and some of whom stated before 9/11, that the US “needed another Pearl Harbor” to condition the American people (and their allies) into supporting war against Saddam Hussein. Author Neil MacKay is a three–times finalist as British Reporter of tile Year in the British Press Awards, Britain’s equivalent of the Pulitzer Prize. MacKay revealed the identity of the Omagh bomber, exposed the British Army colonel who used loyalist terrorists as proxy assassins throughout the “Troubles” in Northern Ireland and unmasked “Stakeknife”, the highest-ranking British army spy inside the IRA. His investigations into the war on terror and the invasion of lraq have won international acclaim. More than 200,000 US readers regularly turn to his stories on the internet every Sunday. In 1999, MacKay famously wrote an article based on briefings with CIA operatives in Pakistan that reported that aI-Qaeda and Osama bin Laden planned to use planes to attack mainland America. He has appeared on TV and radio regularly as a commentator in the UK, France. Italy. Japan. America. Canada, South America, Australia, New Zealand, Germany and throughout the Middle East.